If there has been one relative constant as display technology has advanced over the past decades, it’s that screens tend to be flat. In fact, much research has gone into finding ways to make them flatter, thinner. Now, European scientists are developing an exciting new technology that takes a completely different tack. GHOST, or ‘generic, highly-organic shape-changing interface’ displays allow viewers to manipulate their screens in 3D – to literally drag the two-dimensional images contained therein into our three-dimensional world. GHOST display: this image shows the "emerge" technology which allows on-screen data to be dragged out of the display. Image from GHOST. 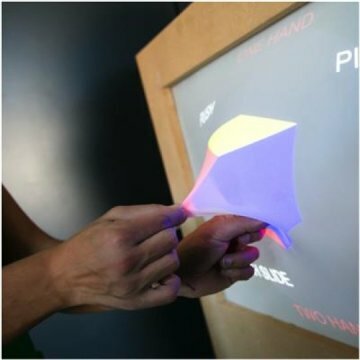 These shape-shifting displays that you can touch and feel promise to find use in a huge variety of applications. Using ultrasound levitation technology, images can be projected out of the screen. Though it sounds like science fiction, acoustic levitation is actually a fairly commonly used phenomenon in the pharmaceutical and electronics industries. Small objects, like microchips, are levitated using intense sound waves that disturb the air (or other medium) around them. Using ultrasonic waves is particularly important as it is inaudible to humans. No word on how your pets will feel about your new interactive display. Likewise, deformable surface materials can be used to allow the screen to be caved in on itself. The team has reported a number of prototype devices taking advantage of the new technology and have established a wide range of potential applications. In a demonstration titled ‘Emerge’, data from a bar graph can be physically pulled from the screen using the finger tips then easily rearranged to better convey the results therein. Another, a new style of smartphone called a ‘Morphee’, can shapeshift depending on your desired interface. That means that your phone might morph into a steering wheel shape when you play a car racing game; it might grow tall protective sides when you enter a password in public; it might swell up when you need to read fine print or shrink down when you want to place it in your pocket. Already, researchers involved in this work have spun off a new company, UltraHaptics, which takes advantage of the ultrasound technology pioneered in this work to create feeling in mid-air. According to their website, “users can ‘feel’ touch-less buttons, get feedback for mid-air gestures, or interact with virtual objects.” If this description doesn’t make it clear enough how cool this technology really is, check out their promotional video which feels like scenes from a science fiction movie. The GHOST project is inspiring in that it reveals how much we can really achieve with a little thinking outside the box. Screens that shift seamlessly from 2D to 3D and back may be a few years away, but these demonstrations show that the science to achieve them is already known and it is no longer a question of if, but when. Via Science Daily and European CORDIS.